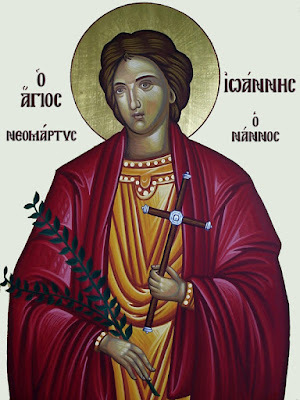 The Holy New Martyr Nannos/John belongs to the Macedonian New Martyrs. He was martyred in Smyrna in 1802 when he was only seventeen years old. Nannos was born in Thessaloniki of Macedonian parents. His father came from the village of Avret Hisar, nowadays old Gynaikokastro in the prefecture of Kilkis, a mere 30 kilometres to the north of Thessaloniki, and his mother in the village of Lokovi, today’s Taxiarchis, in Halkidiki. They became acquainted in Thessaloniki, where they both lived, created a family and had two boys, the elder named Theodore, and the younger John, whose pet name was Nannos in order to distinguish him from his father, who was also named John. The family was Greek and Orthodox, God-fearing and believing in Christ, values which the parents passed on to their children. Theodore knew something of reading and writing, but Nannos did not. The father took the boys to work, from a young age, and made them apprentices in his cobbler’s shop. For as long as the family was in Thessaloniki, Nannos used to love hearing Theodore read him stories from the lives of the saints, particularly the new martyrs, probably from the New Martyrology by Saint Nikodemos the Hagiorite, which had been printed in Venice in 1794 and circulated by the Saint, who lived at that time as a monk on Mount Athos. Nannos also wanted to be like the martyrs and to be martyred himself for his faith in Christ. His father’s work in Thessaloniki did not do well. Relatives who were engaged in the same craft went to Smyrna and assured him that things were better for cobblers there. So he made the decision to go there with his elder son and open a shop. The mother stayed with Nannos in Thessaloniki and, from time to time, the father and elder son returned to visit them. At the beginning of 1802, the father also took Nannos to Smyrna to work as an apprentice in the cobbler’s shop. Nannos was now a good-looking, strapping young man of seventeen and was of the opinion that he, too, would like to be martyred. And in May of the same year, he put into practice a very original plan for his time. Without uttering a word to his family, his father and brother, he decided to embrace Islam and then immediately recant. As an apostate, he would be sentenced to death - martyrdom - by the Turkish authorities. And he did exactly this, quitting his father’s shop and going to work for another cobbler who was a Turk. He told the man that he renounced Christianity and wanted to become a Muslim. No sooner said than done. The Turks circumcised him, gave him the name of Mehmet, and he now worked as an apprentice at the Turkish cobbler’s shop. His family was frantic and looked everywhere for him, finally discovering him at the shop of the Turk. They were threatened with bodily harm however, and told to leave the boy alone, because he now belonged to Islam. In a few days, Nannos went to the Turkish judge (kadi), and told him quite clearly: “I don’t want to be called Mehmet; my name is John." His father and brother heard the news but out of fear did not dare to go anywhere near him, though his father did manage to send him a secret message telling him to hold fast to his faith in Christ. So the Turks decided to put him to death. Before doing so, however, they promised him the world in material goods if only he would remain a faithful Muslim. Nannos persisted in his decision to renounce Islam and the Turks took him off to the Soan Bazaar to be killed. The date and time of his execution were fixed. The Christians in Smyrna were electrified and hurried en masse to witness in astonishment at his martyrdom and, if possible, to take a piece of his relics as a talisman and a blessing. It was Thursday 29 May 1802. The executioner made him kneel and, with a sword, cut off his head. The host of Christians who were present rushed forward and tried to soak a piece of cotton wool in the blood of the young martyr. The Turks left the corpse on the ground as it was and set a guard around it. The Christians bribed these guards so as to be able to take whatever they could as an heirloom and talisman. 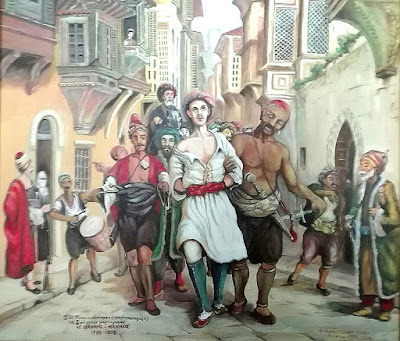 The corpse could even have been dismembered, had not a rich Russian Greek named Panagiotes Panagiotopoulos paid the governor of Smyrna a princely sum to acquire it and give it an honorable burial. A few days after the martyrdom the first miracle occurred with cotton wool soaked in the blood of the new martyr, which a faithful Christian in Smyrna had in his possession: a very sick woman was restored to health. 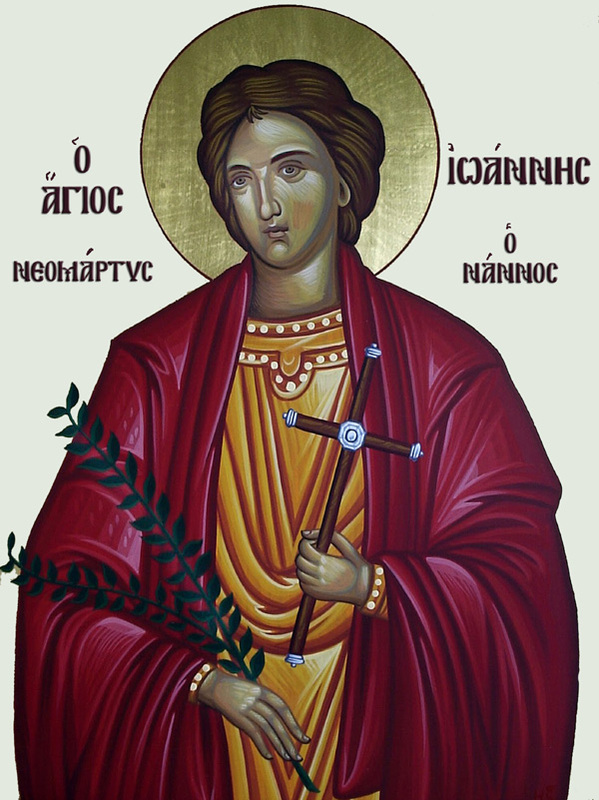 In the conscience of the people, the New Martyr Nannos had been sanctified. The Church later recognized his sanctity and celebrates his memory officially on the day of his martyrdom, 29 May. His martyrdom was recorded by his contemporaries, Saints Makarios Notaras, Nikephoros of Chios and Athanasios of Paros in their New Miscellany, a collection of the new martyrs, which was published in 1819.